October was an exciting month for us with the home of one of our long-time clients being photographed for the latest NZ House & Garden magazine. We worked with these clients over a three year period. The first year was dedicated to Chambourcin Cottage, and the next two we slowly moved through their main home, room by room creating a cohesive look. The cottage and the main house are only metres apart. Both houses were architecturally designed by Steve McGavock, who was the protégé of renowned architect, John Scott. 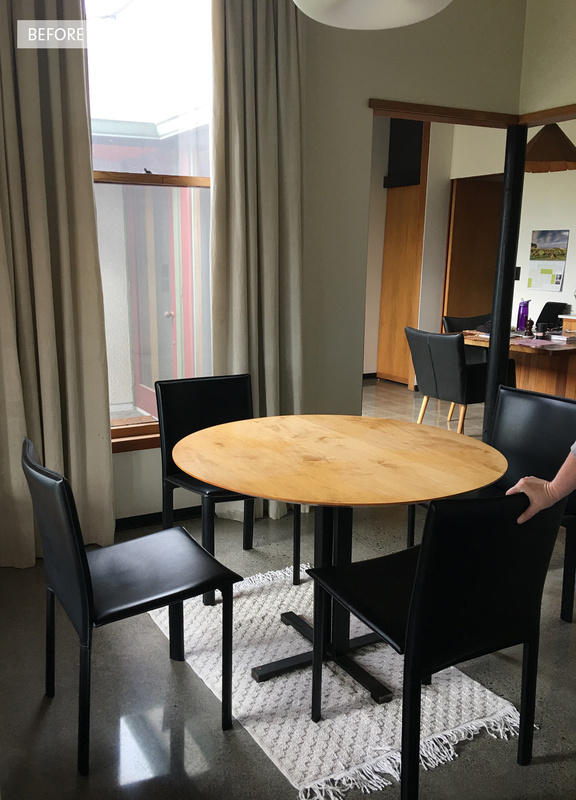 It’s a really special property with a lot of the trademark features found in a John Scott home - high vaulted ceilings, large pivot doors with rimu knob handles, rimu architraves and trims. Set on its own vineyard, the main house is designed so that all of the bedrooms, the living and dining rooms overlook it. There are two wings with the master bedroom, ensuite and ‘snug’ at one end; the office, guest bedroom and bathroom at the other; and the kitchen, laundry, living and dining in the middle. We used Resene Merino on the exterior of the home to tie in with the cottage opposite. Merino is a light and versatile off-white, and we wanted a freshness without it being too glary. We looked at several different colours for the front door. It was initially painted hot pink, but after much deliberation it was re-painted a golden mustard. We had the outdoor rug custom made to fit the front porch. All of the windows had the original rimu curtain tracks and we wanted to keep these beautiful details. But we did replace the curtains throughout with beautiful soft linen from James Dunlop. The inside entrance rug was also custom made to fit the space. Every room has it’s own rug, all Armadillo&Co from our friends at The Ivy House. It really was a blank canvas for us when we first began this project. We had already explored a lot of the design choices for the base of the house when we designed the cottage. The main living area walls were painted Resene Half Merino, and the dark brown beams painted a sharp black. All the carpet was ripped up and the concrete floors beneath polished. We commissioned local artist, Billie Culy, to create the stunning artwork in the living room. Billie worked closely with us and our client, Kim, using a colour palette we supplied her with to fit perfectly into the space. We had chosen a Billie Culy piece for the cottage, so it was nice to have that connection between the two houses. The large orange and white rug was also custom made by The Ivy House, and its job was to zone the living area and anchor the furniture. We custom made the window seat squabs and all of the cushions. Every furniture piece was carefully chosen to suit the style of the home, including the vintage Ole Wanscher rocking chair from Mr Bigglesworthy, which we recovered in a mustard wool. A ladder against the back living room wall leads you up to a cute little loft area which looks down over the living and dining rooms and out to the vineyard. We chose a smart navy blue for the cupboard door and Bruce, our client, painted this along with all of the walls and beams. We had a sofa custom made in soft grey linen to fit the space, and added some simple furniture pieces to turn the loft into a place to escape with a good book or a glass of wine (although not too many, as you have to navigate the ladder on the way down). The loft overlooks the dining room. The linen curtains we had made are so gorgeous. We kept them really simple to work with the clean lines of the architecture, and so as not to distract from the views. The vaulted ceilings meant they had to be a super long drop and they hang off the original rimu tracks. The dining room also has spectacular views over the vineyards and out to the hills beyond. 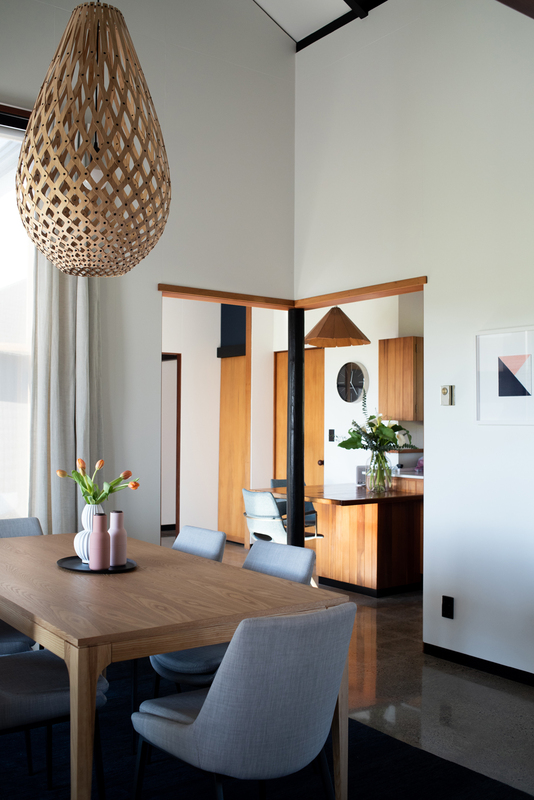 Because the living and dining rooms are open plan we helped to zone the dining area with a stunning big David Trubridge light above, and a luxurious hand woven midnight blue rug anchors the table. When using a rug under a dining table you need to make sure it’s large enough to pull the chairs out whilst still remaining on the rug. After much deliberation our clients opted to keep the kitchen as it is - the rimu cabinetry is synonymous with the John Scott style. We added some lighter chairs around the breakfast bar. The artwork (below) opposite the dining table is part of a triptych that we had commissioned by textile artist, Jane Denton. We chose a Jane Denton piece for the clients’ cottage, and Kim loved it so much we knew we wanted to incorporate her work into the main house too. 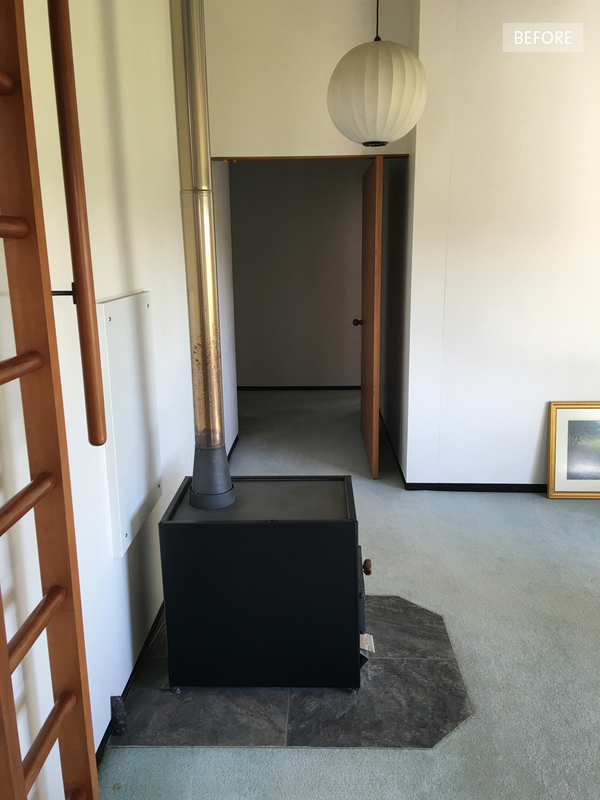 The fireplace in the living room was removed quite early on and made the flow through to the end of the house so much better. A beautiful large pivot door separates the living room from the ‘snug’ and master bedroom. The deep teal we chose for the walls of the snug allows the door to stand out, and looks amazing behind the painting we bought from Amber Armitage. With a lot of different textures combined in the fireplace, we decided to simplify it by plastering over the red bricks at the base and painting them black so the fire disappeared into it. We then added a feature tile on the hearth and framed it with rimu. 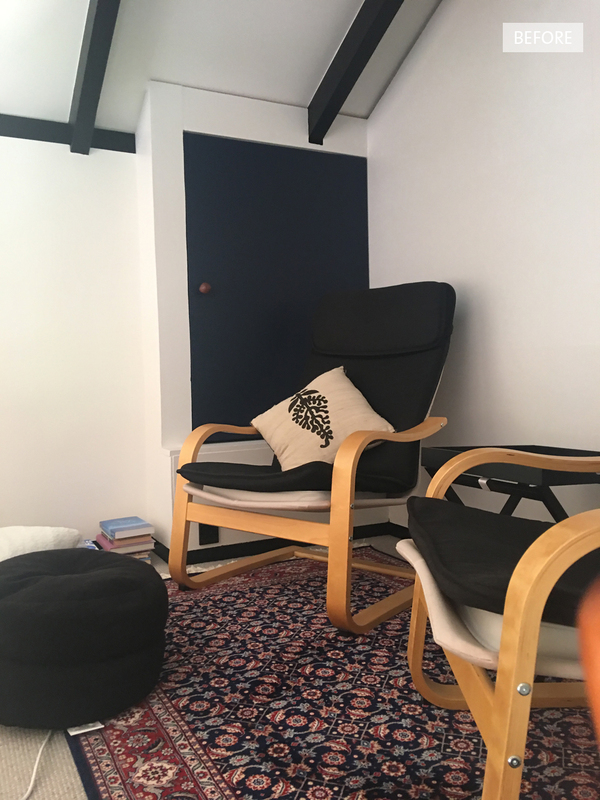 The ‘snug’ is the room that gets the least amount of natural light, and our clients use it to read or watch TV in the evenings. Rather than trying to lighten the room, which can often look a bit flat, we opted to paint the walls a rich, dark teal. A large, plush mustard rug compliments the blue walls and adds cosiness. We added new linen curtains, a pair of super comfy and stylish armchairs from Hutchinsons, and an antique brass coffee table from Soren Liv. 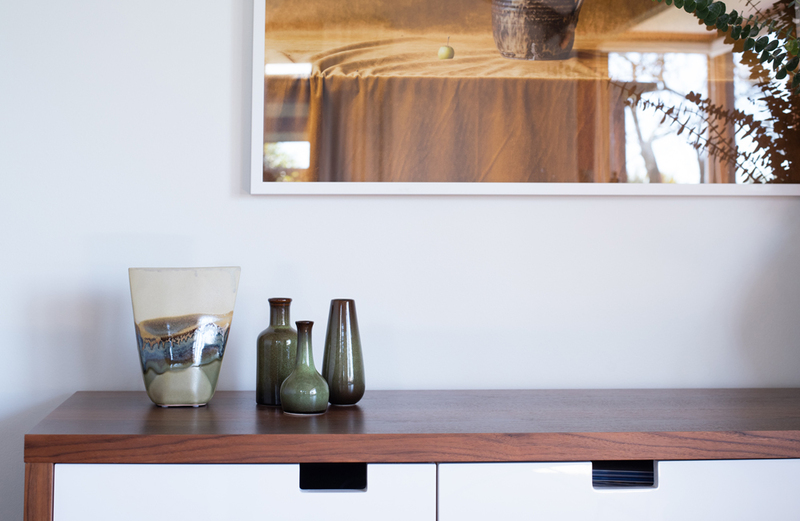 The side table was custom made by WRW & Co. along with a small TV unit (not pictured). On the adjacent wall we placed a beautiful brass bar cart under our clients print to help ground it. Tucked behind the ‘snug’ and to the side of the living room is the master bedroom, which has ‘his and her’ wardrobes behind the bed. We put a green and white wallpaper on the back wall to reflect the views outside the windows, and brought some warmth in with amber bedside pendants and cinnamon coloured linen from Thread Design. 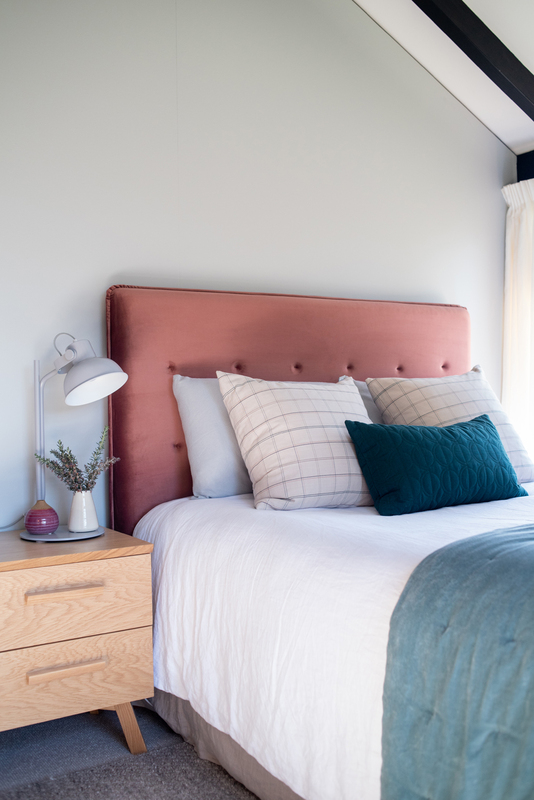 The bedspread is from Seneca, and the custom made cushion pulls all the colours together. The other wing of the house consists of this small bedroom (below) which we turned into an office, as well as a guest room and guest bathroom. We re-carpeted both of the bedrooms and the office, but still added rugs to each for extra luxury. We painted the walls in the office and guest bedroom a soft and peaceful duck egg blue. We love it here teamed with one of our favourite pink sofas, custom made cushions, and a map of Maine (where Kim is originally from). The touch of black in the lamp and side tables adds a bit of weight and links to the black beams. The guest bedroom has new linen curtains like the rest of the house, new bedside tables, a rug, and beautiful new bedding. Other touches are the pottery wall light and pendant we designed, and bench seat (not pictured). It’s been quite the adventure, and a real pleasure working with Kim and Bruce on their amazing home and their cottage. She really is a very special property and we will miss her! Make sure you check out our blog post about the journey we took with Chambourcin Cottage.